Record Store Day is April 18, 2015 this year, and the full list of featured releases can now be found on the official announcement. It’s going to be a hot year for the celebration of local record stores this year, with artists from across the spectrum putting out exclusive releases and remixes available only at record shops and only on a first-come-first-win basis in many cases. 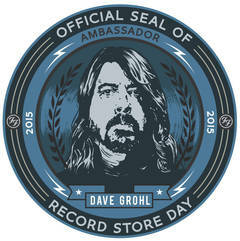 As is traditionally done each year, one artist is knighted as the “Official Ambassador of Record Store Day”, and this year the honor goes to Dave Grohl (of Nirvana and the Foo Fighters, in addition to being the proud owner of the original Sound City console in case you don’t know about that from his Sound City documentary, which is quite a good time to watch). In addition, this year’s main corporate sponsor is Dogfish Head Craft Brewery, who has been very supportive of local record shops over their years, and seems like a great match to be the lead partner beer for the celebration. Record Store Day is a gathering of independent record store owners and employees to celebrate and spread the word about the unique culture surrounding nearly 1400 independently owned record stores in the US, as well as thousands more internationally. The day gets artist support by special new track or album releases, available only in the physical stores. BBQ events, live street shows, artist sitings, and a general festival atmosphere are what the day is all about – in reverence and respect for the independent record stores that still exist in this modern day of digital streams and downloads. RECORD STORE DAY EXCLUSIVE RELEASES. Exclusively available on Record Store Day at Record Store Day participating stores. Will not be available anywhere else in the same format. RECORD STORE DAY LIMITED RUN/REGIONAL FOCUS RELEASES. Also exclusively available on Record Store Day at Record Store Day participating stores, but may not be distributed nationally, or the quantities of these titles are EXTREMELY limited. 1000 and under and WAY under 1000 in some cases. We felt it was only right to put them on a special sub-list, so that everyone is clear on the odds. ‘RECORD STORE DAY FIRST’ RELEASE. These are titles that you can find on Record Store Day at Record Store Day participating stores. So if you’re a fan of the artist, you get first listen. At some point in the future, generally four to six weeks, these titles will be available at other retailers. Freshtone Salutes Record Store Day!